This is a post about Twitter, politics, art, and the value of money. A couple of months ago, I got involved in a Twitter spat around this tweet. Seeing it as regressive that galleries are free strikes me as an unusual perspective, and I strongly argued against it. But it did get me thinking about whether I was responding with more emotion than facts. Most museum staff I know acknowledge that their audience is largely from a narrow, high socio-economic bracket. Do subsidies only prop up the pursuits of those who can best afford to pay their own way? Consideration and research were required. Having looked through the figures so you don’t have to*, here’s what I’ve found. First, some context. All the data I can find on this issue is about museums overall, not specifically art galleries and including institutions like the National Trust, who always charge. There’s a roughly 50/50 split between museums that charge and those that don’t¹. The average admission price is £5.48. The tweeter’s argument was based on a 2016 report by the Association of Independent Museums which does, indeed, find that “What a museum charges has no effect on the diversity of its audience – both charging and free-entry museums have similar demographic profiles for their visitors“. Great! So who are these visitors? Mostly (again according to AIM) people in the highest socio-economic brackets, who are over-represented in visitor numbers. But they’re rich! Maybe museums *should* charge? Well, I still think not. To make this argument, certain facts seem to have been cherry-picked – and ignored. The AIM report makes a more subtle argument than the simple pro-charging one which the tweeter has interpreted. Reading the full summary brings up a couple of very important facts . For example, 50% of charging museums report no impact on visitor numbers from charging admission. Look at the wording – no impact. Contrast that with the 88% of free museums which report their free access has a positive impact on visitor numbers. This statistic also seems important: “Who goes local visitors (i.e. from same county) accounting for a higher proportion of visitors to free admission sites (44%), than paid admission (26%)”. 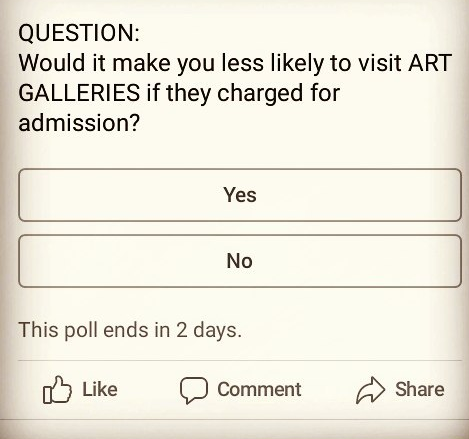 So even if you have a local museum appealing to local or community interests, if you charge admission, the very people you want to engage are nearly 20% less likely to visit. That statistic isn’t linked to socio-economic status. Put simply, it seems to be the case that people visiting paid museums are specific visitors, i.e. people who are already interested in what the museum offers. This obviously works to an extent, particularly for museums with specific focuses (such as military) who might want to explore certain subjects in depth. But if, like me, you believe that museums should do all they can to encourage new and more visitors, rather than simply relying on a narrow audience to continue business as usual, being free seems to be the way to go. But isn’t it still the wealthiest benefiting from free museums, though? I love this tweet. It sums up so much of what I think museums and galleries should be about. That average price of £5.48 may not sound like much. But on limited income, can you afford that once a week? Once a month? What about if you’re on a day out with kids – how many can you afford to pay for? Suddenly, even £5.48 starts to become a barrier. When a museum is free, there is literally no limit on how many times you can come and “change up” your routine. My experience of volunteering in galleries has introduced me to a few of these visitors who come back again and again to see things they like, or just to have some peace in the space. Curious as to what them consensus on the ground might be about this, I conducted my own piece of research in the form of a social media poll. 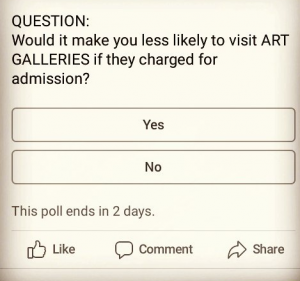 Of the 68 people who responded on Facebook and Instagram, 84% said introducing charges would put them off visiting galleries. Interestingly, amongst those voting yes were artists, creatives, gallery workers – people whose passions and livelihoods would be directly affected by reduced access. While it’s the case now that most museum visitors are better off, there’s no reason this has to be the case. Bringing in charges in fact puts up a barrier where none existed before. The way to deal with a lack of diversity amongst museums visitor numbers is not to argue that we can’t change the system, so we should bring up the drawbridge. Quite the reverse – we should be putting money into outreach. In my recent post on education I considered the complexity of why people may not engage with arts education. Museums are only part of a very tricky puzzle which has to be answered in an intersectional way. Museums, educators, even media – the more people buzzing about the possibilities offered by cultural engagement, the more the visitor profile diversifies. But the money’s got to come from somewhere! Of course, it always comes down to money. To me, though, the question of how much you can get away with charging for is a question which can only arise in a uniquely neoliberal environment, one which is embodied by our current government and the legacy of a decade of austerity. I genuinely believe that art offers possibilities for thought and discovery to every mind, and that encouraging a spirit of inquiry and that the chance to find out the whole picture of what humanity has to offer is a self-evident good. There is an argument to be made for the return of the investment, one based on the positive impact on mental health of creative engagement° and the fact that the arts sector generates more money for the economy than the seemingly higher-profile Premier League³. It might work, but it’s the wrong way of thinking about culture, which has never been simply about making money. It’s about making life a more interesting, entertaining, colourful, emotional experience. Cultural exploration offers a richness different to, but no less valuable than, gold coins in the treasury. A fact which I believe the author of the original tweet, quite simply, doesn’t understand. *But you can if you like – all links are here! This entry was posted in Home, Let's Talk About It and tagged art, culture, museums. Bookmark the permalink.